The list of confirmed participants includes leading global policy-makers such as United States Trade Representative Ron Kirk;European Commissioner for Trade Catherine Ashton;World Trade Organization Director-General Pascal Lamy;Australian Minister Simon Crean;India Trade Minister Anand Sharma, etc. For futher information and registration, please refer to the Summit web site. ESF Chairman Christoffer Taxell, on behalf ESF company leaders and ESF sector specific trade associations, sent today, 6th July 2009 a letter to the President of the European Commission, Mr. Jos� Manuel Barroso, calling for the rapid conclusion of the Free Trade Agreement (�FTA�) which has been negotiated between the European Union and the Republic of South Korea. The schedule of commitments in services and establishment negotiated can contribute significantly to improve conditions of trade in services and investment in Korea. Furthermore, the liberalising services commitments in the agreement will establish an important precedent for similar FTA agreements with other trading partners. We strongly encouraged the negotiators and the Member States to find swiftly a satisfactory way to resolve the outstanding issues. We asked too that the larger and economically more significant interests of those sectors of the economy which stand greatly to benefit from the agreement be given the highest priority in the definition of the EU�s negotiating strategy. We urged the European Union not to let slip the current opportunity to finalise this agreement nor to lose the clear benefits which it can supply to the European economy. 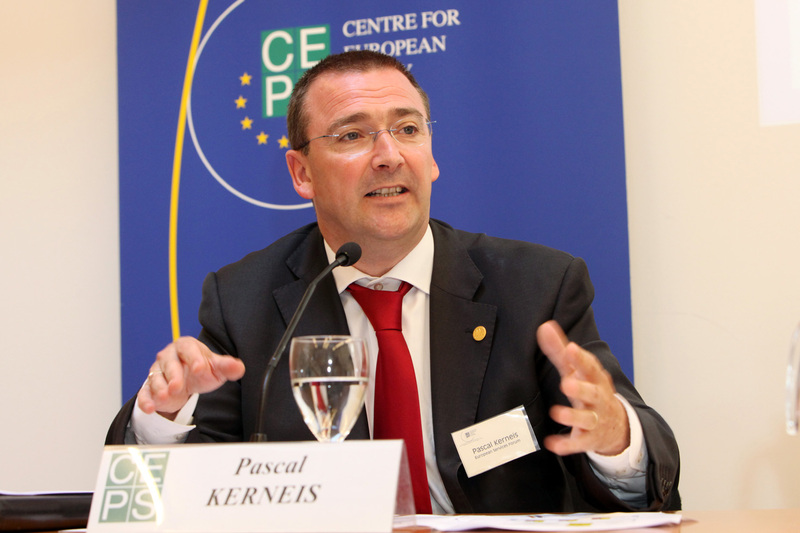 ESF Managing Director, PascalKerneis, participated at a seminar organised by the Center for European Policy Studies (CEPS) on �The New Economic and Free Trade Agreement between the EU and Canada � in cooperation with the D�l�gation G�n�rale du Qu�bec in Brussels on 29th June 2009. The Premier of Quebec Mr. Jean Charest and the Premier of Manitoba Mr. Gary Doer launched the debate with an opening speech on the expectations from the new EU-Canada agreement and what it means for transatlantic relations. Philippe de Buck, Director General of BUSINESSEUROPE and Mr. Roy MacLaren, the Canadian chairman of the Canada-European Union Round-Table for Business (CERT) and former Canadian Minister of International Trade, were also among the speakers. Mr. Kerneis took this opportunity to call the negotiators for an ambitious agreement on trade in services and investment, that should engage all decision makers on the various services sectors, either at federal and governmental levels or national, provincial and local governments and regulatory agencies and authorities. ESF Director participated to a seminar organised by the Islamic Development Bank (IDB) on trade in services in Casablanca (Morocco) on 15-17 June 2009. The seminar gathered trade in services negotiators from more than 15 French speaking countries of the North and West Africa, as well as few English speaking countries of that region that are member of the IDB. It was an occasion to highlight the necessray links between trade and investment in serivecs sectors and sustainable economic development. Mr. Kerneis took also this opportunity to meet with Mr. Khalid Sayah, Director of International Trade Relations in the Ministry of Foreign Trade, and Chief Negotiator of the ongoing trade in services and investment negotiations with the EU, in the framework of the Euromed agreement. He underlined the importance of the legal security of the investment through binding commitments and presented the ESF priorities. An ESF Delegation went to Geneva on 2 April, during the "Services Week" where trade negotiators from WTO members met in various configurations (Council for Trade in Services in normal and special session, the various sub-committees and working parties, the sector specific "Friends Group", etc. ESF met with Ambassadors and Capital based delegates of major trading partners to reiterates the support of the European services companies for a quick resumption of the DDA talks. The GSC issued on 12 March 2009, in advance of the G20 London Summit, a letter send to all G20 leaders. The letter calls for a renewal and strengthening of the "standstill" on new trade barriers, and for the WTO to closely monitor adherence to the standstill. The standstill was first agreed to by the G-20 group of countries at their meeting in November of 2008, but has been breached repeatedly, despite their call to fight against protectionism. It also reiterates the importance of an ambitious outcome to the Doha Round in helping restore global economic growth. It underlines that now is the time for a clear political decision to conclude the negotiations of the Doha Round by the end of this year. Furthermore, the coalition invites the negotiators to an early deadline for the tabling of schedules of new and improved WTO services commitments. �This will enable progress to be made on delayed services negotiations and ensure that the trade commitments actively sought by the economically important services sectors could also contribute meaningfully to global economic recovery�, the Coalition says. ESF participated to the Hearing organised by the Committee on International Trade (INTA) of the European Parliament on "Trade in Services in Mode 4 and Circulation of Workers" (WTO GATS - Agreement on Services) that took place on 19th January 2009. In its presentation, ESF argued in favour of a quick adoption of the proposal for a directive on "Blue Cards" and of the proposal for a directive on a single application procedure for a single work/residence permit for third country nationals that enter the EU through a trade relation, so as to improve the attractiveness of the EU. ESF also called for better Mode 4 offers by the EU key trading partners, eitherin the framework of the WTO negotiations or through the ongoing bilateral and regional trade negotiations. The European services industry, in a press release, called upon world trade ministers to resume urgently the WTO Doha talks in Geneva , as instructed by the G20 leaders in Washington on 15 November 2008, and to adopt the modalities on agriculture and goods products before the end of this year. It is more than timely to close this modalities' chapter so that negotiators finally enter into serious negotiations on services. This means that "agreement on the modalities must be accompanied by a well-defined roadmap on the services negotiations, with clear and short deadlines leading to the conclusion of the DDA in the coming months" said Pascal Kerneis, Managing Director of the European Services Forum ( ESF ) when speaking to the EU Trade Commissioner Catherine Ashton and French Trade Minister Anne-Marie Idrac at a Market Access Symposium in Paris on 27 November. ESF urged WTO members to enhance their revised services o ffers, building upon the promises made in Geneva at the Signalling Conference on Services on 26 July 2008. ESF Chairman Christoffer Taxell sent on 10 November 2008 a letter to EU Trade Commissioner Ashton on the on-going FTA negotiations between the European Union and South Korea , urging the EU Chief Negotiator to conclude a deal with strong services components. The European Services Forum has just come back from a mission in South Korea where daily difficulties for the European services companies on the ground have been identified and assessed. It is clear that only proper trade negotiations will give the necessary boost to prompt the government into further reforms. That is the reason why the European services industry strongly supports the conclusion of a bilateral free trade agreement between the European Union and South Korea . Such an agreement should bind the current level of openness by the Korean legislation towards the foreign services suppliers. The offer by Korea in the signed Korea-United States free trade agreement should form the basis of an agreement with the EU. Furthermore, new market access should be negotiated in sectors that are of importance to our companies, like in telecommunications, maritime transport and news agencies, and market opportunities should be improved by negotiating further concessions in legal services and financial services. GSC call to G20 to refrain from protectionism in international trade and resume DDA talks as a response to the financial crisis: The Global Services Coalition issued on 3 November 2008 a letter urging leaders of the G-20 group of nations to use their upcoming meeting in Washington, DC to make a "forceful commitment" to refrain from raising new barriers to international trade. The letter sent to the leaders of the G-20, was signed on by more than a dozen leading services associations from around the world. It urges the G-20 to resist protectionist temptations, and to commit to resuming the Doha negotiations in earnest. The participants of the so-called G-20 who will attend the Whashington Summit on 15 November 2008 will be: Argentina, Australia, Brazil, Britain, Canada, China, France, Germany, India, Indonesia, Italy, Japan, South Korea, Mexico, Russia, Saudi Arabia, South Africa, Turkey, the United States and the European Union. ESF Director made a presentation at the "International Services Forum" that was organised in Taipei (Taiwan) on 28 October 2008 by the Taiwan Coalition of Service Industries, the General Chamber of Commerce of Taiwan and the Taiwanese Bureau of Foreign Trade. The presentation was entitiled "The trend of international services trde & investment" with a particular focus on Asia and the EU. ESF Chairman Christoffer Taxell gave a speech at the opening ceremony of the Asia-Europe Business Forum, that took place in Beijing on 22 & 23 October 2008. The AEBF traditionally takes place just before the the ASEM Summit (Beijing, 24 & 25 October 2008), gathering the 43 Head of States and Governments of the European Union (27), of the ASEAN (10), China, India, Japan, Korea, Mongolia & Pakistan, as well as the President of the European Commisison and the Secretary General of the ASEAN. Mr. Taxell chaired the previous AEBF which took place in Helsinki in September 2006. ESF Chairman Christoffer Taxell in his speech at the opening ceremony of the ASEM Business Summit on Trade in Services, that took place in Beijing on 20 & 21 October 2008 undelined the importance importance of services in the ecomonies of Europe and Asia, in their mutual trade and investments. He said: "Now more than ever, it is important to keep markets open and to open those that are closed. I would urge all governments to resist any protectionist pressure that will undoubtedly come with the financial and economic crisis. Now more than two weeks ago, it is important to defend the value of globalization and the mutual promotion of our economies". The two days event gathered more than 200 servics experts from many ASEM countries, with a programme dealing with transportation services, tourism, consulting services, etc. ESF Chairman Christoffer Taxell sent today (3rd July 2008), in advance of the forhtcoming Special meeting of the General Affairs and External Relations Council dedicated to WTO on 18th July, a letter to French President Sarkozy, as current President of the European Union, as well as to all 27 EU Heads of States and Governments and 27 EU ministers in charge of trade issues, calling them to do all they can to ensure a success of the ministerial meeting in Geneva later this month, especially in securing firm indications of liberalisation from the signalling conference on services which the Commission has rightly championed, and thus to create the momentum for completing a successful Doha Round by the end of the year. Global Services Coalition Expresses Disappointment with WTO Services Text. In response to the release of the Doha Round services text on 26th May 2008 by the Chairman of the WTO Council for Trade in Services in Special Session, the Global Services Coalition issued a joint statement where signatory associations reiterated their call for strong services offers and urged WTO Members to quickly convene a Ministerial-level signalling conference that will clarify and reinforce the commitments which WTO members, including those who have advocated a substantial outcome on services, will need to make. WTO members' real intentions for services market-opening must be clearly stated, to pave the way for substantive and detailed discussions on balancing the three pillars. The European Services Forum (ESF) today welcomed the two revised Chairman�s papers on agriculture and non agricultural trade in the framework of Doha round. (Press Release - 22 May 2008) The publication of both texts mark an essential outcome in the WTO talks and pave the way for a long awaited horizontal process where trade offs with other crucial issues like services market access will finally be discussed. �It is time for the negotiations to finally enter into a final stage� said Christoffer Taxell, Chairman of ESF. �There is an urgent need for the negotiations to now take a much wider focus that must include services market access. Although the negotiation on services involves a different pattern, it is nonetheless as important for international trade as the negotiations on agriculture and industrial goods. Trade negotiators must now engage at the highest level in global trade talks and this requires that all the issues be on the table. A round without a strong services package will not be balanced, so let�s now discuss services at the ministerial level�. The Global Services Coalition, in a Geneva visit with 42 business services representatives from more than 15 countries, insisted that services must be seen as one of the three key market access pillars of the Doha Round of global trade talks, along with agriculture and non-agricultural market access (NAMA). (Press Statement - 16 April 2008) . The Coalition also expressed strong support for the "signalling exercise" - an ongoing process of bilateral meetings and discussions among senior officials and ministers - to encourage key countries to improve their services offers so as to demonstrate the potential benefits available from concessions across all three pillars of the Round. The Coalition welcomed the decision of WTO Director General Pascal Lamy to convene, chair and report on the Signalling Conference on services. This conference will have the same level of political importance as the ministerial green rooms meeting on Agriculture and NAMA , and the unambiguous commitment of the Director General will be a tremendous asset for its success. ESF and ESF Members attended the Mini Hearing that was organised by MEP Syed KAMALL (UK - EPP) in the European Parliament on Tuesday, 26 February 2008 on "Trade in Services", in the framework of the International Trade Committee of the EP. ESF and three ESF Members sponsored a dinner in the Parliament organised by Rapporteur S. Kamall, so as to pursue his consultation in the view of the drafting of his report that is scheduled for the coming months. The dinner gathered MEPs, academics and business representatives. ESF and nine other coalitions of service industies, in the framework of the Global Services Coalition, issued a joint press statement on 12 February 2008, in reaction of the Report released few hours before by Mexico Ambassador Fernando De Mateo, Chairman of the Council for Trade in Services � Special Session (CTS SS) on the Elements Required for the Completion of WTO Services Negotiations. They welcome the report as it affirmed that services are one of the three pillars of the round. However, the Coalition said that the report is only a start, and that an intensive and sustained process of services negotiations must now follow. "To ensure that services take their proper place alongside agriculture and NAMA in the Doha Round, there needs to be an early signaling conference involving Ministers, preferably before the conference on modalities for agriculture and NAMA, to clarify and reinforce the commitments which WTO members will need to make on services," said Christopher Roberts, Chairman of the policy committee of the European Services Forum. On 11 December 2007, the European Services Forum (ESF) announced the appointment of Mr. Christoffer Taxell, Chairman of Finnair, as new ESF Chairman. On taking up his functions Mr. Taxell reaffirmed ESF�s commitment to services liberalisation around the world. �Internationalisation of European services companies is vital for the strength of the European economy. Business needs to see ambitious services commitments through the WTO and in the EU�s free trade agreements.� Mr. Taxell�s distinguished career has included senior positions in politics, business and academia. He was until 2006 Chairman of the ESF�s member the Confederation of Finnish Industries EK (Christopher Taxell Biography). 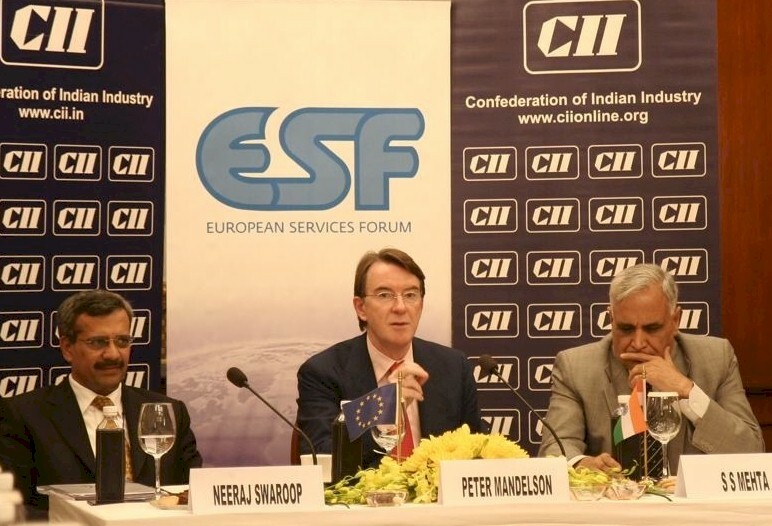 A strong ESF Delegation visited New Delhi on 28 - 30 November 2007, in the framework of the 8th India-EU Business Summit that took place on 29th November, with the participation of Trade Minister Kamal Nath and EU Trade Commissioner Peter Mandelson. The delegation hold a seminar with Indian services business representatives, organised jointly with the Confederation of Indian Industry (CII), where Trade Commissoner Madelson highlighted the current importance and the potential of the services trade between the two blocks and their role in the sustainable economic development. The delegation had also a debate on the mutual interests in the current negotiations of the EU-India Free Trade Agreement with service companies representatives at the premices of FICCI, the Federation of Indian Chamber of Commerce and Industry. Then the delegation paid visits to many high level civil servants in the ministry of commerce, of finance, of telecommunications, and regulatory authorities. Twelve Services Coalitions, in the framework of the Global Services Coalition, adopted on 13 November 2007 a Joint Statement aiming at keeping up the pressure on the content of the text that the CTS SS Chairman, Ambassador de Mateo, is drafting. The statement aimed at ensuring that the text would state a high level of ambition for the services negotiations, and fix dates for new services offers. It carried the message that the services sectors believe that the text should signal convincingly that the goal is to obtain the maximum number of bindings and new market access in as many of the key service sectors and subsectors as possible. It suggested many elements that this text should embrace. The statement has been sent to the negotiators in Geneva and in the various capitals in advance of the CTS SS meeting hold on 15 November, where WTO Members gave their first reactions to the Chairman�s report after its round of consultation. Services Commitments must be part of the final EPAs:Lord Vallance of Tummel, Chairman of the European Service Forum, sent a letter to EU Trade Commissioner Peter Mandelson, EU Development Commissioner Louis Michel and the EU 27 Trade Ministers on the necessity to ensure that the European Partnership Agreements will include, in their final stage, commitments in the main services sectors, as to unleash the potential of trade to create employment and growth in the private sector of the EPA regions. Although ESF understands the need to accept interim agreements on goods only (including trade facilitation) for those EPA regions that are not ready to conclude a full agreement, it should be clear that such interim agreements can in no way be seen by the negotiating partners, or by industry in Europe , as a satisfactory result. ESF therefore asked the Commissioners and Ministers to ensure that the interim agreements contain binding commitments to continue negotiations. Experience has shown that a review clause does not always fulfil its purpose. Our EPA partners must now fully engage in negotiations on the remaining issues to give investors transparent and secure conditions to participate in the development of the often missing infrastructure of the economy of these regions. The European Services Forum and the International Trade Policy Unit of the London Scholl of Economics and Political Science organised a Conference on: �WHY SERVICES ARE CRUCIAL FOR CONCLUDING THE DOHA ROUND�. The event took place in London at the London School of Economics on 15 October 2007. In his Keynote Speech, Mr. Pascal Lamy, Director General of the World Trade Organisation (WTO) said that the services revolution has transformed the way we live and work� "Aided by technology, millions of financial, banking, insurance, accountancy, retail, media and travel transactions are conducted daily across borders" he said. He reaffirmed that services are a critical component of the Doha Round. Positive results are needed in services so as to complete the single undertaking. He highlighted that greater ambition in the services negotiations presupposes careful domestic preparation and coordination across a wide range of ministries and agencies. He underlined the fact that �political ambition is the element that has been missing from the services negotiations and which is urgently needed to ensure substantive progress� (This speech is also availalbe on the WTO Website). Lord Vallance of Tummel, Chairman of the European Services Forum introduced the Conference (Speech) and Mr. Peter Sutherland, Former Director General of GATT & WTO, and Chairman of Goldman Sachs presented the view of the businesses, the benefits of services liberalisation on the world economy and called upon the WTO chiefs negotiators to take their responsabilities so as to conclude the round (Speaking Notes). ESF issued a press statment at the end of the event, welcoming Lamy's speech at this crucial moment of the Doha Round.